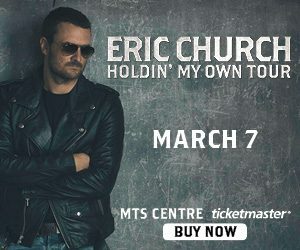 Eric Church will be performing at MTS Centre on March 7th at 8pm! The 2016 CMA album of the year winner is bringing him Holdin’ My Own tour to Winnipeg! This should be an amazing show – it’s all about Eric. No opening act, and he’s performing 2 sets. Tickets are still available at Ticketmaster. Looks like it will be a great night! Giveaway is open to all Canadians, you just need to be in Winnipeg on March 7th to attend the show! Good luck to everyone, and the giveaway will end on Tuesday Feb. 21st at noon. *****Congrats to Susan C who wins the tickets! So hard to choose! I’ll have to say Talladega. Like both Facebook pages and shared the link! Favourite song is a toss up between Smoke a Little Smoke and Drink in My Hand! Liked MTS Centre and Eric Church on Facebook! Kill a Word is my favourite song, I have liked Eric Church & MTS Center on FB & shared the link. If I had twitter & knew how to tweet I would have, but sorry I don’t lol! I would love to take my daughter to this concert. Tfanks for the chance! My favorite song is Drink on my hand. I like Eric Church on facebook. I’m hoping to surprise my husband with these tickets. Thanks for the contest. Kill a Word is my favourite song. That’s right around my mom’s birthday, would love to take her! Liked Eric Church on facebook. Would be awesome to win tickets. So many favourite songs but probably Over When It’s Over. Like both MTS Centre and Eric Church. Posted this link on Facebook and Twitter! Fingers crossed, I would LOVE to go!! Kill a word is an awesome song ! liked MTS Centre on FB. My favourite Church song is Three Year Old. Really tugs at my heart as it came out just as my son turned three and I can totally relate. Liked MTS centre on FB! Liked Eric Church on FB! My favourite Eric Church song is Like a Wrecking Ball. ‘Like Jesus Does’ is one of my favorite Eric Church songs. Many great ones but have to go with Springsteeen. Kill a word would be my fave!! Liked liked and commented. Will share the link right now. Good luck all. Love so many of his songs but this one is special Wrecking Ball!! well lets go with Kill a Word. What a great song. Over when it’s over!! I would love to win, last time I saw him I was very pregnant and very uncomfortable! Liked MTS Centre and Eric Church on FB! And posted the link to the giveaway on Fb, and tweeted on Twitter! It would be great to win a pair of tickets to see Eric Church. My favourite Eric Church song is Drink In My Hand. Thank you for having this ticket giveaway. I like MTS Centre on Facebook. at the MTS Centre on March 7 2017. It would be terrific to win a pair of tickets to see Eric Church. I shared your giveaway on Twitter. I shared your giveaway on my Facebook wall.